How’d you like to wake up to this on the bedroom wall every morning? 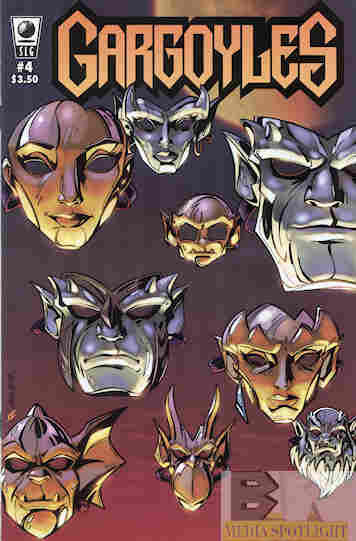 The party gets underway, but Xanatos is forced to visit a party in DC where he’s approached by Illuminati #2. Things are further awkward between Goliath and Elisa when each brings a date. However, Goliath’s date is Delilah, the clone created from Demona and Elisa, and Thailog wants her back as well as the rest of his clones, who blindly fall back in step with him. They drop in but Owen was prepared with an army. Thailog gives up his guns and Owen goes to fetch Delilah, under protest from Goliath until he mentions that she should have the right to decide for herself. But when Owen and the security leave Thailog stabs Goliath! What they got right: Thailog (for those of you who don’t know, it is Goliath spelled backwards because he’s an evil clone of Goliath) makes for a good threat. We get some fun moments as the Gargoyles also dress up (although they don’t have to…Angela has to talk Brooklyn into wearing one while Hudson spends time with his blind human friend Jeremy along with Bronx–Bronx would be hard to explain to the guests, so that was a smart move). What they got wrong: The art isn’t quite right. It looks kind of stretched out and exaggerated, like some of the lesser animated episodes. The show was amazing visually so this kind of stand out. It isn’t bad but just not quite right. No, I can’t do better. So what? Recommendation: A fun moment but there’s sure to be tragedy coming. It’s worth checking out but I’m still undecided if I’m keeping these comics beyond the first two issues. Posted by ShadowWing Tronix on April 18, 2018 in Animation Spotlight, Television Spotlight, Yesterday's Comics and tagged David Xanatos, Elisa Maza, Gargoyles, Goliath (Gargoyles), Hudson (Gargoyles), SLG Publishing, Thailog.